It has only been a few decades since we discovered that food contains an important element which is absolutely essential to the maintenance of normal physiology. This element was discovered about fifty years ago by Casimir FUNK, who called it a “vitamin”. 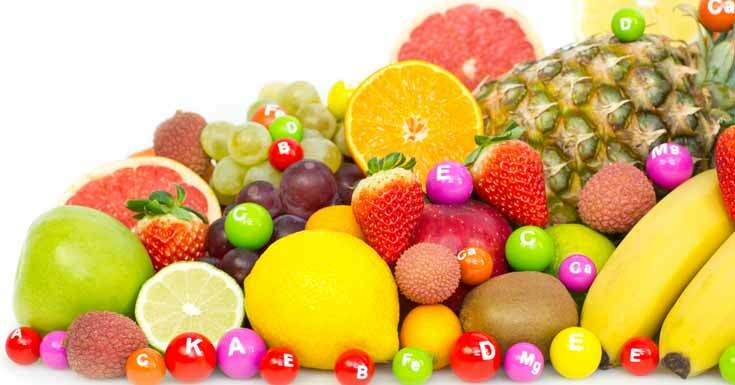 We now know that there are several different vitamins, each of them fulfilling a specific role in nutrition. One of the main vitamin groups is fat-soluble, the other is water-soluble. It has been proven that there is a strong similarity between vitamins and the internal secretion products. Vitamins are essential for the use of elaboration materials in nutritional processes, although they cannot be considered true elaboration materials themselves. The function of vitamins seems to be in some way related to the stimulation of internal-secretion glands. Like organic mineral salts, vitamins are found in plants, fruits and natural or unrefined foods. Vitamins are vital substances in natural foods, which are essential to the consumer. By the modern commercial processes of refining and the chemical treatment of foods, vitamins and mineral salts are destroyed, lost or chemically altered, which renders them useless in the maintenance of the body. Vitamin and mineral salt deficiencies are responsible for almost all chronic illnesses. If these elements are missing from the diet, then functional and degenerative changes occur in the nervous system, along with similar alterations in the organs and body tissues. Syndromes that result from the lack of these substances are chronic under nutrition and mineral exhaustion, disruptions of the digestive and assimilation organs, functional problems and the malnutrition of the nervous system. Some organs become atrophied or shrink when these elements are missing from the body, beginning with the testicles, the spleen, the ovaries, the pancreas, the heart, the liver, the kidneys, the stomach, the thyroid and the brain. Gastric, intestinal, biliary and pancreatic insufficiency are major consequences of a diet that is too rich in starchy food and too poor in vitamins and other essential nutritional components. Vitamin deficiency also produces significant effects on the reproductive organs in men and women, and often leads to sterility. Although each vitamin listed below (with their specific benefits to the body), it is very important to state that a multivitamin is always the best approach to take. Individual consumption of vitamins can be more hazardous to us than sometime not consuming them at all. It is always recommended to consult a Natural Health Practitioner before getting into a therapy of any single consumption of vitamins. Also, it is always important to seek a plant derived vitamin and not the man-made kind which are only chemically made. Vitamin A Vitamin A is fat-soluble and sensitive to light and heat. This vitamin promotes growth and is therefore of particular importance for children. Experiments have proven that it prevents rickets and eye pains. Some vitamin A-rich foods are: un-skimmed and untreated milk, egg yolks, butter, cream, celery, lettuce, cod-liver oil, dried spinach, fresh tomatoes, green vegetables, apricots, liver, hearts and kidneys. Some recent studies tend to show that vitamin A has anti-cancerous properties which are preventive as well as therapeutic. These results must be confirmed by future studies. Vitamin B Group These vitamins are water-soluble, and seem to be the most important of the vitamins. It has been proven that without vitamin B, the other vitamin factors are practically inactive. Vitamin B provides nervous reserves, and prevents and heals certain forms of neuritis. Its absence causes a terrible illness called beriberi. Some vitamin B-rich foods are: milk, egg yolk, nuts, tomatoes, fish, beans, oats, peas, wheat, barley, corn and other food grains. Vitamin B1 (Thiamin) is essential to the metabolism of glucides and promotes the transmission of nerve impulses. It is particularly found in beer yeast and in the husks and germs of food grains. Vitamin B1 deficiency is quite common in cases of chronic alcoholism. Vitamins B2 (Riboflavin), B3 (Niacin) and B5 (Pantothenic) are involved in protein synthesis and are found in food grains (husks and germs), meat, fish, milk and eggs. Deficiency is rarely isolated and generally associated with other deficiencies. Vitamin B6 is involved in a number of protein and fatty acid metabolisms and in the functioning of the nervous system. It is found in pork and mutton, food grains, eggs and dairy products. Vitamin B6 deficiency is often related to poor intestinal absorption. Vitamin B12 is essential for the synthesis of blood cells, and also acts on neurons. It is an anti-anemic vitamin. It is present in foods of animal origin, i.e. essentially in liver, milk, eggs, fish, shellfish and meat. Deficiency can occur in strict vegetarians. Folic Acid (B9 or L1) Essentially found in green vegetables (spinach and asparagus), liver and eggs, folic acid acts in synergy with vitamin B12. It also comes into play during the synthesis of DNA and RNA, and is therefore essential for the elaboration of blood cells. It is an anti-anaemic vitamin, and deficiencies are more common than with other vitamins. Vitamin C Vitamin C, which is water-soluble and destroyed by heat, is mostly found in fresh fruit and vegetable juices, oranges, lemons (which contain a lot if it), tomatoes, fresh cabbage and other fresh vegetables. A lack of vitamin C causes a disease called SCURVY and promotes tooth decay. It comes into play in various metabolisms and syntheses. It strengthens the body’s natural defenses against infection. Vitamin D Vitamin D is found mostly in fish-liver oils (tuna, mackerel, cod, salmon, lamprey and halibut) as well as in cocoa pods. Plant-based foods contain no vitamin D; we obtain it essentially through sun-rays. A vitamin D-deficient diet causes growth disorders, ossification disorders, bone and teeth deformities as well as all the signs of hypocalcaemia, since vitamin D allows calcium absorption. Vitamin E Vitamin E is found in corn and peanut oils, food grain germs, watercress, lettuce, egg yolk and liver. Vitamin E avitaminosis causes an atrophy of the reproductive organs and sterility in humans. Its properties are related to reproduction and nerve and muscle function. Recent studies lead us to believe that vitamin E has anti-infectious properties. Furthermore, its “anti-oxidant” role in the cell makes it an anti-ageing vitamin. When taken on a regular basis in high doses with vitamin C, these two vitamins prolong life significantly (studies made on rats). Vitamin PP Vitamin PP is found in high quantities in yeast, rice polishing’s, cabbage, tomato juice, liver, lean meat and whey. This vitamin comes into play in the mechanism of cell respiration. Vitamin K Vitamin K is found mostly in cabbage, spinach, green leafy vegetables, tomatoes, oat sprouts, and barley and soya oil. It allows the synthesis of a number of factors that are essential for blood coagulation. A deficiency causes various hemorrhages. A characteristic of vitamin K is that it is also produced by intestinal bacteria. Other vitamins are presently being studied: – H (biotine), – H2 – J (choline) The effectiveness of vitamins can be considerably altered or suppressed by excessive heat. For this reason, canned foods are deficient in vitamins and other mineral elements, and should never be the main part of a meal. Microwave is also another vitamin (and also enzymes) suppressing agent.